Breed Purist or Poor Judging? Did you ever walk out of a judge’s ring and wonder just what breed was being judged and sure it wasn’t on the other end of your leash? I’m sure you have. This seems to be occurring more and more, especially for those of us that have breeds that were developed for specific jobs or activities. We’ve all heard complaining about a particular judging session or AKC judges in general. And, sure, someone has to be unhappy with the judge’s decision. But what if it’s not sour grapes, what if that judge was actually be trying to salvage the essence of their breed! Every breed has a written breed standard supplied by the parent club. The AKC breed standard describes how a dog should look, how it should move and even information about the general personality. Many aspects of the breed’s appearance are specified in detail, from the size of the males and females, the coat texture and length, whether it’s a double coat, if the body shape is square or oblong, and even if it should single-track. Why are these detailed specifications? Have you read your standard lately? What about breeds bred to go to ground? If they’re larger than their quarry, they won’t be able to enter the earth and do their job. Too small or too large and that dog wouldn’t be functional so most breed standards mention size. Japanese Chins and many other small dogs were bred specifically to sit on your lap and entice the fleas off the human. Would you appreciate a 50-pound Japanese Chin sitting on your lap? Some standards specify neck length, needed so the head carriage is appropriate to their breed and needs. After all, the head is vital for zeroing in with the eyes and ears on the quarry. Is there a size requirement or recommendation? Possibly there’s a DQ (disqualification) for too large or too small? Why is size important? Can you imagine a Saint Bernard too small to carry its brandy cask, a Belgian Malinois too small to bring down a suspect, or a Labrador Retriever that is too small for someone to hold onto as a seeing eye dog. If the breed is required to work in severe conditions, then the coat is of necessary consideration. Double coats protect not only from the weather but also the brambles and other brush whereas thick dense furnishings distract from the ability to swim for dogs that are water retrievers. Did you know that the shape and angle of the feet can affect the speed, footing and, for those dogs that work underground and need to dig, the trajectory of the dirt being thrown behind them? If dirt piles up under or directly behind a short-legged terrier, it could effectively block him in the tunnel with no room to turn around and maneuver. Prick ears vs drop ears, long tail vs short tail, these look like cosmetic effects but drop ears protect the inner ear from damage, prick ears can rotate to hear better and identify the direction of the sound while funneling the sounds to the inner ear, and loose skin allows more leeway when grabbed by another dog or animal. Something as seemingly minor as the white tip on the end of the basset or beagle tail has a distinct purpose, as it assists the hunter in spotting their dog in high grasses. So why are there so many incidences where it appears that the dog rewarded with a win is not equal to the standard? Why are dogs 50% larger than the recommendation winning? Why are we seeing dogs that should move in parallel planes single tracking or even crossing over? What about double-coated dogs being shown in single coat? Penciling means the coat should look like a penciled or sketched drawing, yet we see solid color coats when the standard clearly details a penciled coat. Every nuance in a breed standard protects the essence of the breed and also is necessary for them to do what they were bred to do. The question is – where should the blame be placed? Let’s start with the judge who is, by AKC definition, well-versed on the standard for the breed. Yes, there are points that are interpretable and judges can and may have preferences, but when the judge is negating the written standard and ignoring points that allow the breed to do the job it was bred to do, that is unconscionable. 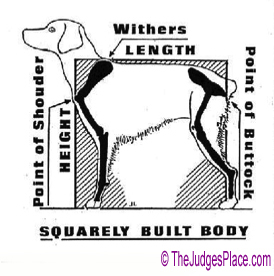 The dog show judge is an integral part in the formation and development of a breed . Wouldn’t it make sense that any judge not only be knowledgeable on the breed standard but also the purpose of that breed and what aspects of the standard enable the dog to do what it was bred to do? Breeders who just breed to the dog du jour (what’s winning) are not taking their job seriously. Neither are breeders who don’t bother to work their dogs to prove the dogs still have not only the physical capability but also the inclination to do their job. If your dog doesn’t have a job other than love and affection to its owner, then it should be well-socialized and obedience trained. Herding dogs should be allowed to herd, hunting dogs do some sort of hunting tests, and terriers do Earth Dog tests. Greyhounds, Salukis and other sight hounds are built for speed and delight in being given the chance to chase something, anything! We should not have one style for working and another for conformation and a third for agility. 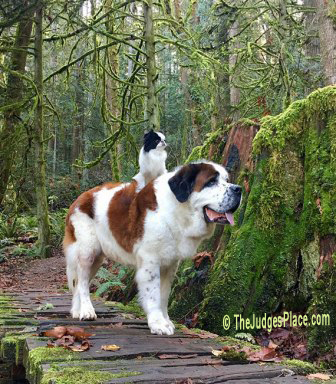 Ever hear the phrase “a well-balanced dog is titled at both ends”? As the late esteemed judge, Annie Rogers Clark always said – “Form Follows Function”. Breeders should be the first line of defense for maintaining their breed standard. Do not breed willy-nilly to whatever is winning. Have a plan. Test your dogs for their innate ability and physical capability to do their job. Choose breeding pairs for the positive aspects that breeding will do for your breeding program. Keep in mind that the breed standard should be your guideline. Handlers, yes, you are also part of the problem. Stop enhancing features to the detriment of the breed’s purpose. It’s a conformation test to find suitable and good breeding stock. It’s NOT a grooming contest! Don’t run with dogs that should be walking. Don’t string up dogs so their front legs and feet aren’t moving normally. Don’t enhance color, don’t scissor those that are specified in their standard as “do not scissor” and don’t expect a dog to be a robot that just goes around the ring. They have personalities that correspond with their jobs, allow them to maintain that personality. As for judges, get out of the ring and see what the dogs you judge were originally bred to do. That will enable you to choose your winners with a true knowledge of the standard and WHY. Go to herding events, lure coursing, carting, earthdog, and any other breed specific event. Be part of the solution and not the problem! The bottom line is – if the dog can’t do what they were bred to do, are NOT attaining the breed standard!! Our Readers Respond To "Who Judges Dogs, Judges or AKC?"